Images provided by Lyric Culture. This post is sponsored by Lyric Culture. Since music is the language of love, singer-songwriter Hanna-Rochelle, who founded the company in 2006, decided to marry fashion with her love of music and bring artists’ words to life. Lyric Culture is a music-inspired lifestyle brand based on the song lyrics of legendary artists such as Bob Marley, The Beatles, The Rolling Stones, Bob Dylan and Pink Floyd as well as current hits made famous by Rihanna, Usher and Carrie Underwood. They produce an assortment of creative, stylish, and bold apparel, jewelry, accessories and home goods. We especially love their adorable and comfortable decorative pillows! If you’re hoping to accessorize better this spring, look no further than our Lyric Culture giveaway! CupidsPulse.com is giving away two love-filled Lyric Culture products to two lucky readers: the Bold as Love by Jimi Hendrix scarf ($65) and the All You need is Love necklace ($35), inspired by The Beatles hit song. 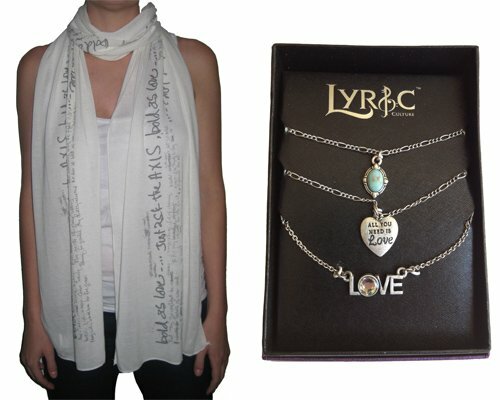 GIVEAWAY ALERT: To enter for a chance to win either the Lyric Culture scarf or neckalce, go to our Facebook page and click “like.” Leave a comment under our giveaway post letting us know that you want to enter the contest. We will contact the winners via Facebook when the contest is over, and they will have three days to respond back with their contact information. The deadline to enter is 5:00 p.m. EST on Friday, February 22nd. Good luck!